At last we have a formal history of the legendary business that Manny, Moe and Jack built. This book is both a history and a celebration … a colorful journey that chronicles our past and affirms our future. Reaction to the book has been tremendously positive. 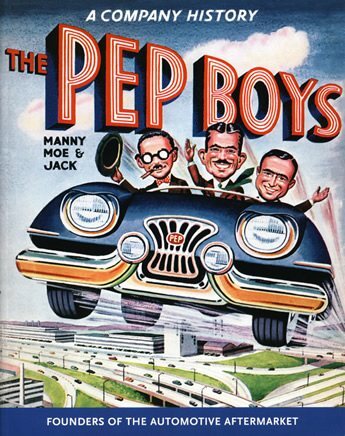 Scott Kaminski, Project Manager and Archivist, The Pep Boys — Manny, Moe & Jack, Inc. The Pep Boys pioneered the automotive aftermarket industry when the company opened its first store in 1921. Its founders, the famous Manny, Moe, and Jack, were real people as well as icons of American advertising. To convey the spirit of Pep Boys and its “go-forward” turnaround strategy, the Philadelphia-based company commissioned this lively, richly illustrated 96-page book — its first-ever history. The book also led to national publicity on The History Channel! Author Marian Calabro appeared on the popular “Modern Marvels” series to talk about The Pep Boys and 1950s automotive history. Award Winner: The Pep Boys won a MarCom Creative Platinum Award (highest honor) for writing and excellence in marketing communications. Sponsored by the Association of Marketing and Communication Professionals, this annual competition typically draws 5,000 entries. The Pep Boys placed among the 1 percent of Platinum prizewinners in the writing category. 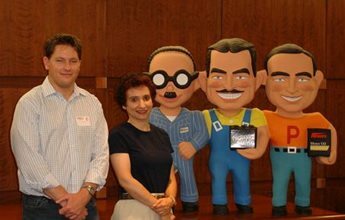 During a break in the production of “Modern Marvels: Auto Stores” for The History Channel, CorporateHistory.net president Marian Calabro posed with program producer Scott Goldie and Pep Boys mascots Manny, Moe, and Jack. The cover is an adaptation of the company’s 1953 Annual Report. Inside, the Timeline shows a thumbnail of every Annual Report cover from 1946 onward—a great way to illustrate style and logo changes.